Madison visited her first country outside of Norway!! I was so excited to use her passport and get her first stamp. Then Jason told me about something called the Schengen region - a group of countries that don't check passports or stamp them. Grrrr. They didn't check her passport in Norway OR Hungary. Boo. Good thing she'll get one in a couple of weeks when we go to Aberdeen! Anyway, Madi did great on the flights again and we arrived safe and sound at the Hern's apartment. Bret and Elizabeth are working with The Art of Marriage, a great Family Life resource for married couples. Jason and I were blessed to attend the premiere of it when the Hern's were living in Arkansas. Now the Hern's have been in Budapest for about a year now and since they are empty-nesting, have become walking tour guides about the city. It was great to just walk around with them and hear the history of different buildings and places and enjoying the unusually warm sunny and 70-degree temps we had the whole visit! And the Starbucks happened to be next to the beautiful St Stephen's Basilica. We took some group photos on our walk over. 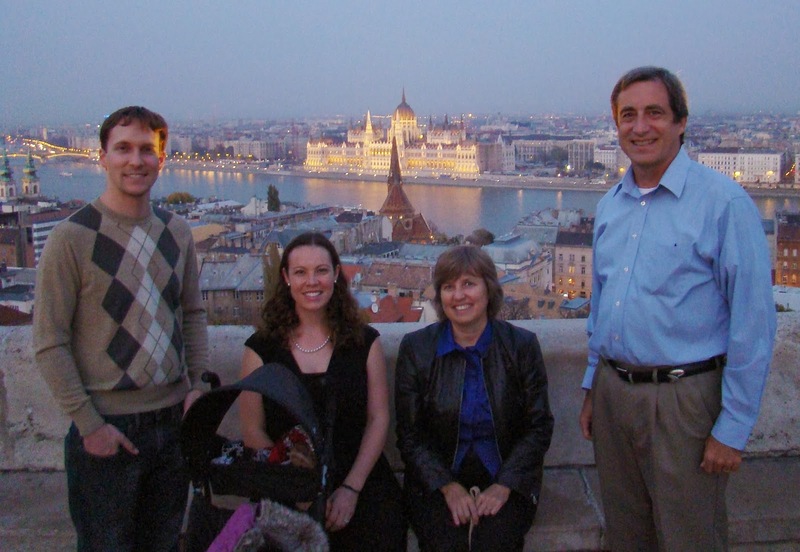 And the three of us headed up to the top to see the great views of Budapest. We continued walking around the city and took a boat taxi along the Danube river. That evening we went up to Fishermen's Bastion on Castle Hill. We got there before sunset and enjoyed walking around. Saturday we visited the Great Market Hall. It was a bit chaotic having a stroller and trying to navigate around the tiny aisles. We had a delicious meal there and I went back with Madi and Elizabeth (using the carrier and no stroller) after Jason left to do some shopping. On our way back we stopped at Parliament. We left the little duck with the Hern's and enjoyed visiting the historical building. On the other side of the river the previous day. Jason, Madi, and I ventured our Sunday morning to a cinnamon roll place called Bites. Oh my goodness!! It was just the sweets fix that we needed. And the white hot chocolate Jason had was the most divine thing I have ever tried! Budapest is known for having delicious and fancy hot chocolates. YUM! We visited the Dohány Street Synagogue (The Great Synagogue). That afternoon we made our way over to Heroes Square. Monday morning was Jason's last day in Budapest. The three of us went to breakfast at Briós kávézó while the Hern's went to a meeting they had across town. Madi was talking up a storm and loved watching the cars and people walking by!! Then we later ventured out and got donuts... okay, okay, we went a little food crazy, but everything was so cheap and so good!! Jason made it home safe and sound Monday night and I stayed a couple extra days. I was able to get one last long run in before my half marathon that following Saturday and got to do a bit of shopping in a place significantly cheaper than Norway! It was overall a fabulous trip!! I had a bit of a bumpy road home traveling alone with Madi, but we made it safe and sound. We were so fortunate to go visit the Hern's and spend time seeing their amazing city!